This is the current—and hastily organized—state of Michael’s desk. Help him out? 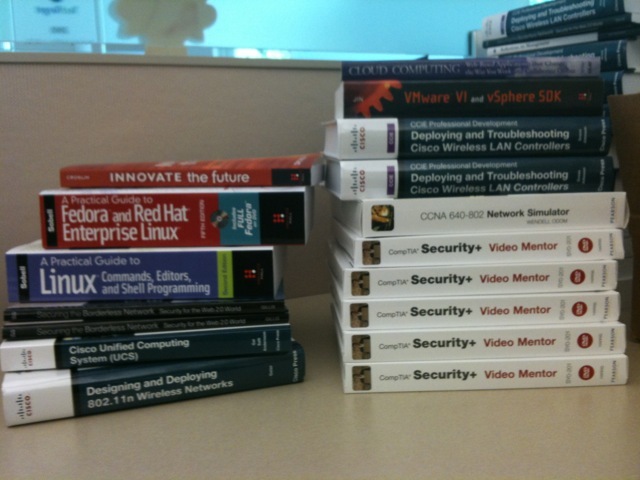 If you want some sweet IT books, head over to IT Answers and get to answering. See a question tagged Windows 7 in 2010 and know the answer? Give it your best shot then send me an email at Melanie@ITKnowledgeExchange.com or send us a message @ITKE with the link to the question, and you’ll get to take your pick of Michael’s deskmates. We’re giving five away, so get started! A Practical Guide to Linux Commands, Editors and Shell Programming 2nd ed.